Aalayam - Colors, Cuisines and Cultures Inspired! : Home Tour - Eclectic Splendor! Home Tour - Eclectic Splendor! Remember our first home tour where we took you through the stunning Zen Den of Roopa and Abhi? Well, today we will take you on another charming home expedition! Join me as we tour the Dallas home of my dear friends Kiran and Divya. I love their home. I have had the privilege of enjoying their hospitality and can you tell first hand that their home - a visual stunner, is painstakingly put together! And if you have a little girl, then definitely stay tuned - you will fall in love with the whimsical flair of their daughter's room! Their home is a loving example of how one can mix many eclectic elements and still create a warm and welcoming tapestry. 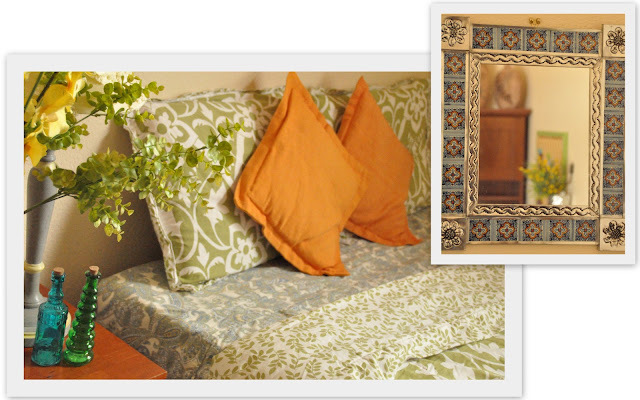 Different shapes, colors, textures and patterns all come together in this vignette! 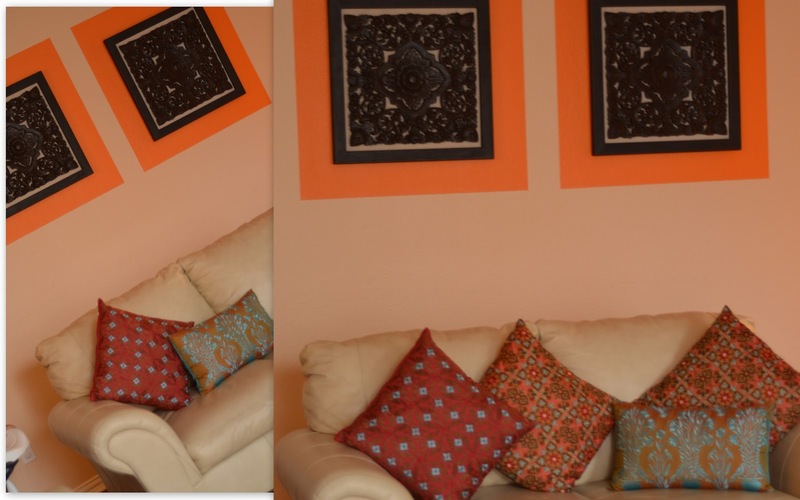 Here is what Divya wrote as she sent me the pictures of her home… "Kiran and I like our space to be both functional and inspirational. We strongly believe that picking the right decorative items can brighten up your living space and your life. With busy schedules, like most working couples, decorating together is an activity we bond over in addition to family time with our little daughter." From the ethnic Ravi Varma print on the fireplace to the multicolored candle stand on the dining table to the brightly colored embroidered pillows on the sofa, this home has several tiers of color, texture and pattern all coming together to create a seamless visual palette. Divya and Kiran find as much joy in the process of ornamenting as they do in the end-product - an aesthetically appealing abode! Referring to her accessories, Divya writes, "Most of the items we buy are simple, inexpensive pieces that we love. Sometimes, we envision a look and scout for pieces that will fit in. The inspiration for the decorative dark toned wood frames with the intricate scroll design in our living room came from a high end store. When we eventually found similar frames hidden behind a mirror at the local Home Goods, without the high end price tag, we were ecstatic! We knew it would fit right in with our vision! We painted the orange boxes to offset the dark wood and to add some color." What a clever and simple way to add some drama to an otherwise plain wall! The wall anchors the sofa and the fabric pillows nicely and the whole orchestration makes a great decor statement in their family room. If there is one thing I have learnt about decorating over the years - it is patience! It takes a lot of patience and perseverance to create a home of your dreams. Divya agrees and adds, "We spend more time planning and positioning things, than we do buying. The mantel décor was envisaged around some of our cherished pieces. 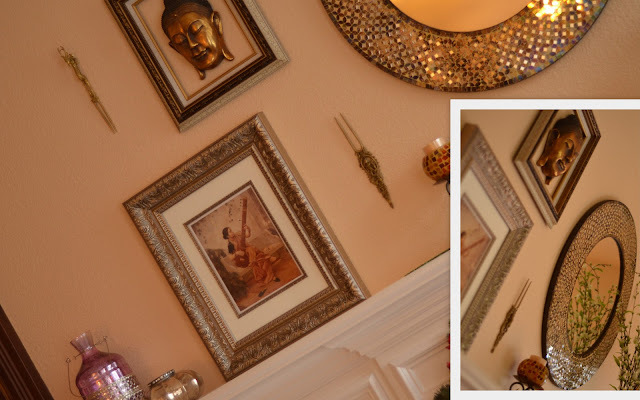 The Ravi Varma Print, the serene Buddha we had picked up from a zen store in Vegas and the ethnic brass hairpins from India were all collected over the years. Instead of sprinkling them around the house we decided to order them in a vignette above the mantel. We loved the end result!" I did too! The fireplace vignette- group 'em together! Home decorating is all about creating a beautiful and enjoyable space that tells a story about who you are. Divya and Kiran's mantel vignette does just that. It speaks to their patience, perseverance and sense of style! Next up, one of their guest rooms that doubles as a study. In her role as mom, IT professional and Master's student Divya's day is definitely busy! At the end of a packed working day, attending to her daughter and her graduate course-work is no easy task and she needs all the inspiration and motivation to keep her going. She writes , "We kept the colors in this room bright -greens , yellows and blues so I'm inspired to use the room more!" Don't you love this work-space? This room has plenty of natural light streaming in - great for a work area. My favorite feature has to be the galvanized tin buckets that serve as pen holders! What a clever way to free up some acreage on the table and move things to the wall! She is also very hands-on when it comes to home decor and in her own words, she writes .. "Lately I’ve found it very relaxing and rewarding to take up some DIY projects. Some of them adorn the walls of my study. 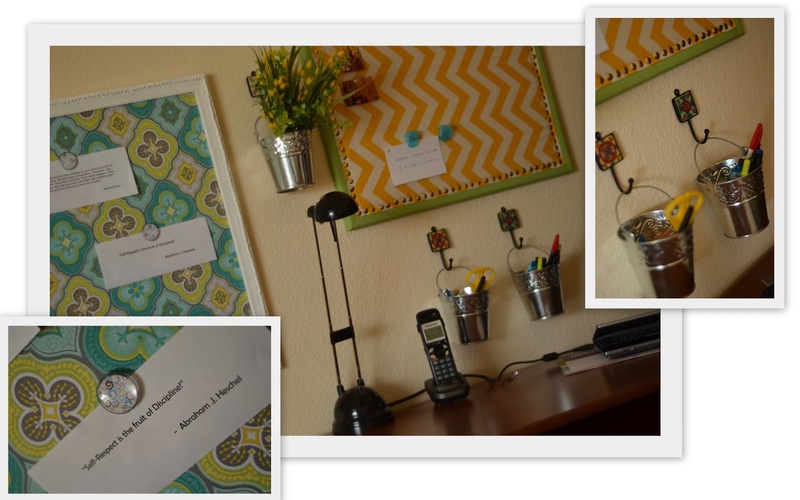 A framed magnetic inspiration board and a framed fabric board to hold reminders and pictures. They are both functional and decorative!" DIY projects are a fun way to add a personal stamp to your home! 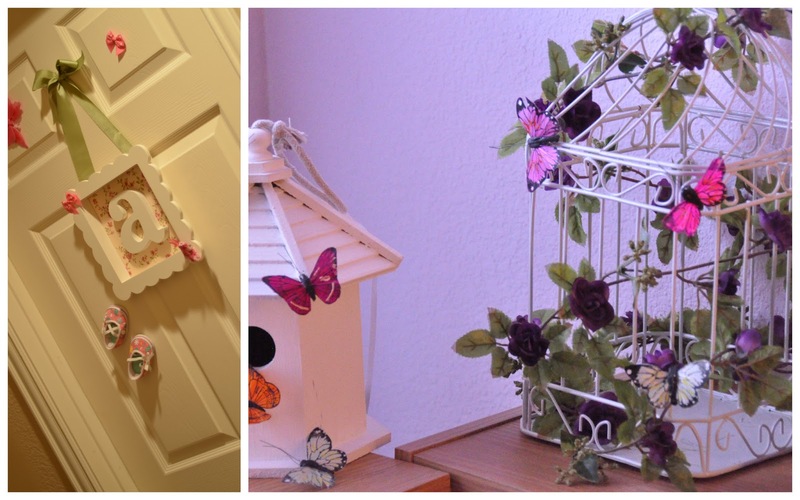 It is also a great way to cut some decorating cents! The other guest room is done up in yet another fresh color giving the room an airy feel. 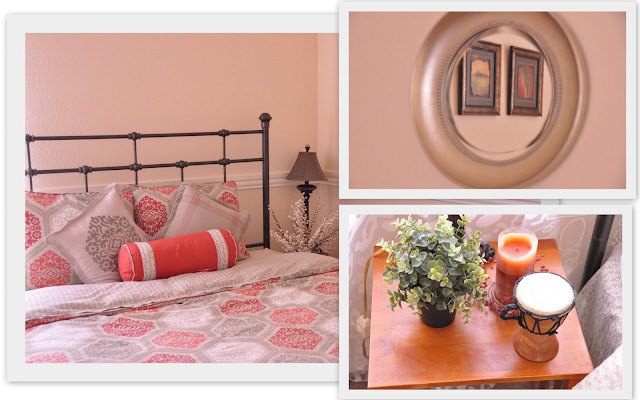 She writes, "The peach room is the smallest room in the house - we tried to keep the colors light again and used a metal headboard to avoid overwhelming the room with a solid wood headboard. It is a small yet functional space.The bed lamps were bargain finds at an auction and the bedding was procured at Christmas sales" Smart, don't you think? A perfect example of a mixed configuration of accessories working wonderfully to create a vibrant home! And, I saved the best for the last. 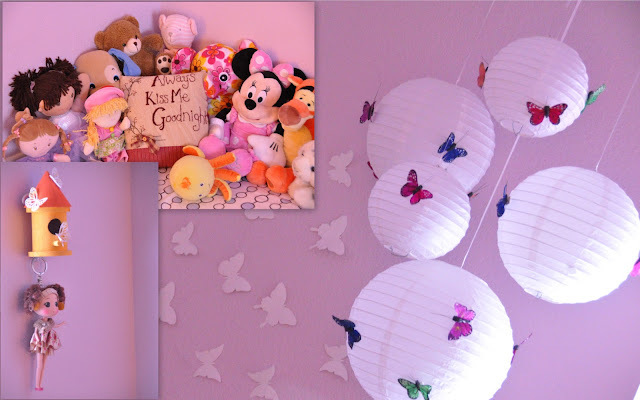 Their adorable daughter's beautiful room! The lilac paint and all the little details sets this room apart from any other generic room - truly, a little girl's delight! Whimsical is what comes to mind when I think of this room. Divya writes , "Aanya’s room has been decorated in a whimsical butterfly theme. Some of the décor I used for her birthday party has been repurposed as wall art or table decor - the paper lanterns and the bird cages. Her first pair of shoes are lovingly displayed at the entrance" Wow! This room is truly a labor of love. So, that dear readers was Aalayam's second home tour. This home exudes eclectic elegance and is perfect for this young family! Hope you are inspired by Divya and Kiran's design philosophy - of mixing elements, being patient, working with a budget and telling a story ? I am! Many thanks to my friends and homeowners for sharing their beautiful home with all of us. Leave us a comment and we will share them with the homeowners. p.s: All images are copyrighted by the homeowners. Please ask before use. Thanks for reading Anu. Indeed, it is a lovely home - visually inspiring and funcitonally great! I am glad they agreed to feature it on Aalayam! Helen: thanks for reading! Indeed! my friends have a wonderful medley of colors, patterns and textures going - none of which is overbearing. It's all done just right! do come back for more...next up, we will be featuring a few corners from supriya and my home. Visiting ur blog for the 1st time ..enjoyed reading it. Brinda: thanks for visiting and reading. Eclectic is often an overrated term used rather loosely in the design world...to me it simply represents collecting and featuring things that you truly love to make a home "your" home and that's what these homeowners have done..
yes, do come back...we have some really exciting posts lined up..including corners from supriya and my home! Job well done to both Divs and Dee! Proud to be your friend! Thanks for reading and your kind words of appreciation. It was fun collaborating on this project with divya.